Front from left, the President of Egypt, Abdel Fattah el-Sissi, the Chairman of the African Union and President of Guinea, Alpha Conde, German Chancellor Angela Merkel and the President of Tunisia, Beji Caid Essebsi, pose for a photo during the conference 'G20 Africa Partnership – Investing in a Common Future' in Berlin, Germany, Monday, June 12, 2017. BERLIN (AP, JUNE 12, 2017) — German Chancellor Angela Merkel sought to drum up global support for African development as she hosted African leaders Monday ahead of next month's Group of 20 summit. 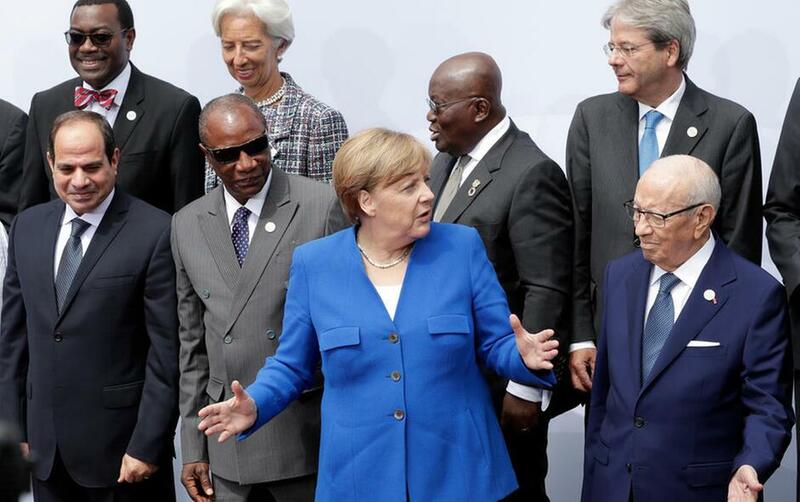 Merkel gathered the leaders of current African Union chair Guinea, Egypt, Ivory Coast, Ghana, Mali, Tunisia and others in Berlin to discuss a so-called "compact with Africa" to help finance countries' development needs. She acknowledged that "development is only possible if security is assured." Merkel contrasted Germans' average age of 43 with an average age in Niger and Mali of 15 as she underlined the population pressure African countries face. "If we don't give young people any prospects, if we don't invest in education and qualifications, if we don't strengthen the role of girls and young women, the development agenda won't succeed," she said, noting that if the young have no hope they'll feel they have to seek a life elsewhere. "By working together with you for your countries, we will create more security for ourselves" and put people smugglers out of business, she added. The German government said Monday that it had agreed "reform partnerships" with Tunisia, Ivory Coast and Ghana, part of a planned investment of up to 300 million euros ($335 million) to help African nations. The programs aim to expand the use of renewable energy, improve energy efficiency and develop the financial and banking sector, the Development Ministry said. It said Tunisia, Ivory Coast and Ghana "stand out by virtue of their reform-oriented policies." Merkel will host the annual summit of the G-20 global economic powers in Hamburg in early July.